Paperwork is like a river. The paper comes in, floats through various stages and should flow back out—unless you’ve got a beaver in your home office that built a dam. Then you’ve got a wall of papers. Creating a workable paperwork system is all about dealing with the flow. As a professional organizer, I know you can’t just look at the stacks and piles on your desk (and on the floor and in boxes). You need to look at the ways the paper comes in, how it flows through your space and why it ends up in a dam. There are basically three actions for all papers: You can toss them, act on them or save them for some purpose. 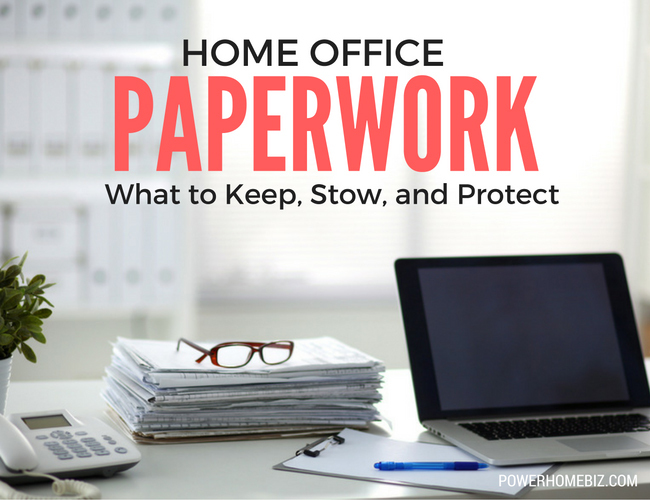 The best way to get paperwork organized is to begin with today’s papers rather than with piles of older documents. Today, handle each new piece of paper you receive with a decision. Remember, there are only three actions: keep, toss or act on it. Once you’ve handled each item that comes in today, then you can do some of your older stacks and files. Otherwise, each day you spend on the old stuff is a day new papers come in and add to the stack. You’ll never get caught up that way. Having one set spot for incoming papers. Having at hand a place for each action, including a trash can and shredder nearby. Use a to-do file for action items. Have a basket for items to be filed. Create a routine for filing those items on a regular schedule. Keep in mind that you don’t want to mix up any current projects with piles of older paperwork. Make sure to create a physical separation between the workspace you use daily and the spot where you are going to work to tackle your mountain of unfiled papers. Set up a workstation for clearing up your old papers using an extra desk or a card table. Add a task lamp and a comfortable chair. Label boxes to hold your sorted papers depending on each decision: keep, trash or shred. Add a container for “to-do” papers. Even if the papers are old, you’ll find reminders as you look at them and wonder if you should update your insurance or if you were ever repaid for something. Instead of stopping what you are doing and getting distracted by a task, set it aside in a to-do box to tackle later. Sit down and work on items using a method that works for you. Remember to divide up the work into a reasonable amount. Most people don’t have the time or attention span to sort papers for days on end. Try setting a timer for a given amount of time, doing a particular stack or section or counting out a certain number of items to deal with. As a professional organizer, I’m often asked how long to keep financial paperwork. People are often surprised when I don’t have a firm answer. They’ll tell me they’ve heard three years or seven years or not at all. Those answers might be right or they might not be right, as every case is different for every individual. The best solution for deciding how far back you need to keep papers is to go to the professional—ask the person who handles your taxes. Different deductions, depreciations and financial matters each need a different number of back-ups. Get a customized answer for your business situation. You will certainly be keeping a certain number of years of financial paperwork. Set up dividers in your box of papers to keep and divide these items by year. Sorting by years makes it easy when it comes time to discard your oldest materials. When I help organize home-based businesses, I’ll discover that often people who work at home have no “home” for their paperwork. There are either no filing cabinets or too small of a cabinet stuffed with older papers. Create a designated space for stowing papers. It’s all part of the flow. You’ll be planning where papers go when they come in, where they go next and where they are going to end up. Sometimes small businesses or at-home companies get hung up on how much space it will take to properly stow everything. Keep in mind that just because you need to keep something doesn’t mean you need to keep it in the room with you. Keep current projects and the most recent year or two of financial documents at hand. Box and label old projects and older records. Store them in the attic, on shelves in the garage or even use a professional storage and retrieval company. In today’s digital world, you’d think you can always get a copy of something. While that’s often possible, it can be very time consuming to track something down. There are some things you might not be able to track down, like a receipt for an expensive piece of jewelry that was stolen. There are other documents you need on hand at all times to protect your identity. Here are some ideas for items you should lock away in a safe. Make sure to choose a fire-resistant safe. Beyond papers, you should consider locking up your petty cash, company credit cards, gift cards and keys you need to protect from others. So What Do You Get Rid Of? For decades we’ve heard the term “paperless society,” but it hasn’t happened yet. 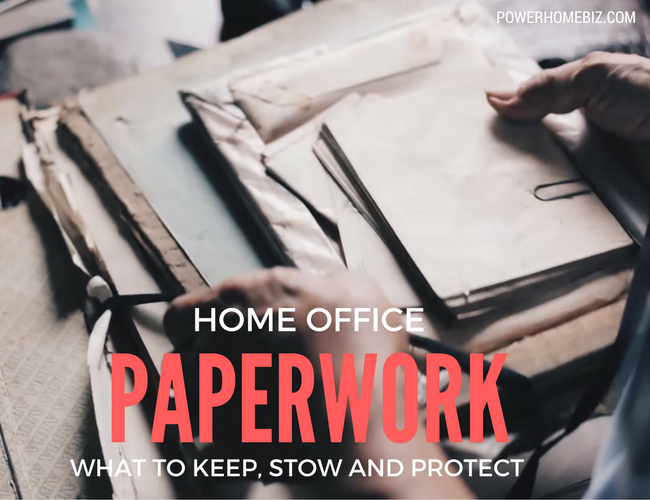 Even if you are determined to scan every single paper and keep it electronically, which is a very time-consuming option, it’s likely you’ll still have vital documents you need to be able to hold on to and keep safe. Lea Schneider has years of experience advising business people on organizational principles that make them more productive. Lea writes her tips on home offices for The Home Depot. If you are researching types of safes for your valuable paperwork, you can view a selection on the Home Depot website.